Size: 5.4" x 2.8" x 0.4"
The Canon F-73 followed the unique F-72 and replaced the foldable housing with a traditional landscape style design. 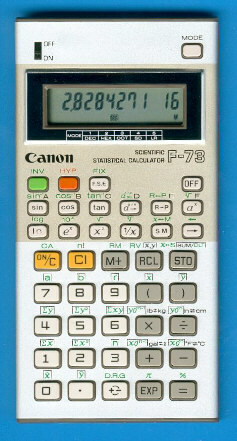 The F-73 was introduced together with the almost identical F-73P adding a small program memory to the common scientific/statistical functions. Dismantling the F-73 is quite interesting, the inside story is 100% identical with the programmable F-73P, even the keyboard is complete. Marketing just closed the key openings of an existing calculator. Canon introduced the F-73 and F-73P together with the Financial Manager and added later even a printing version with the Financial Printer. Running Mike Sebastian's "Calculator forensics" on the F-73 gives a result of 9.0000278593. We know this number from a lot of later Texas Instruments calculators like the TI-30 SLR and the TI-31. © Joerg Woerner, April 5, 2004. No reprints without written permission.